This is scrumptious and crunchy, sweet and sour, hot and biting. Just the thing for a hot summer’s day, or evening, if we get one soon! 1 To make the dressing, put sesame seeds in a small dry frying pan and toast gently until golden; be careful not to burn them. Tip them onto a plate to cool. Whisk oils, kecap manis or soy sauce, sweet chilli sauce, lemon juice and shallot. Add sesame seeds. 2 Put prawns in a sealable plastic bag and thaw quickly under running water. Shell prawns leaving tail shell intact. Make a slit down the back of each with a small sharp knife and remove the black or red vein. Rinse and pat dry. Put prawns in a dish with oil and a good grind of black pepper. Fry in a non-stick frying pan over medium heat (scrape in all the oil) for a few minutes a side, until golden. Season lightly with sea salt. 3 Put cabbage in a large bowl with spring onions, carrots, red pepper and chillies. Pour over dressing and toss well. Add mint, coriander, bean sprouts and a few pinches of salt. Toss lightly. Dish into bowls. 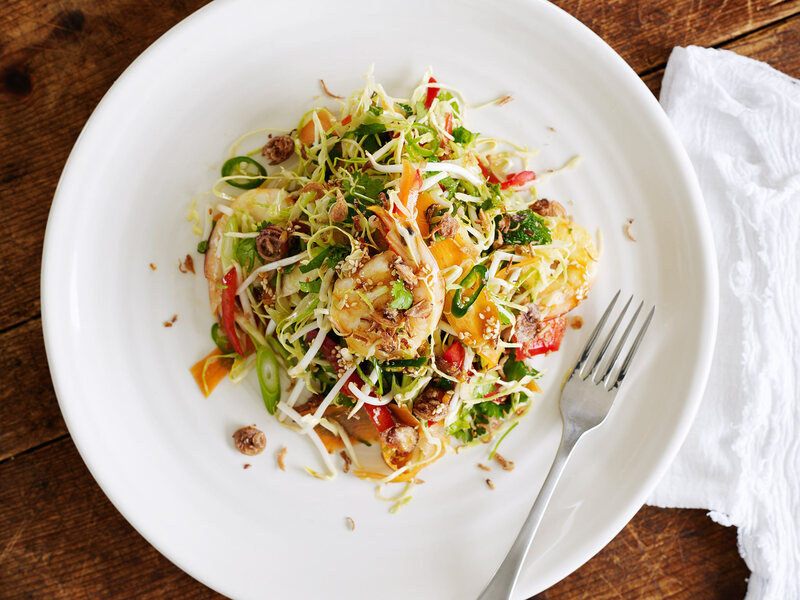 Arrange prawns on top and sprinkle over crispy shallots if using. Serve immediately. Kecap manis (or ketjap manis) is a thick and sweet soy sauce made from soya beans, palm sugar and spices, hailing from Indonesia. 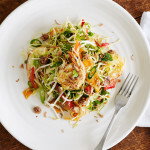 It is particularly good in this salad because it gives the dressing a syrupy consistency and rich spicy sweet flavour. Search it out in Asian food stores. Store refrigerated once opened. Be sure to use sour lemons, not sweeter meyer ones as you need the tartness to balance the flavours. If it does taste a little sweet, quickly squirt over a little more lemon juice, or lime juice would also work well, or serve with lemon or lime wedges. Prawns with Chorizo – Surf ‘n Turf sings! Make sure the prawns you throw on the barbie are up to scratch.